MUFF WIGGLER :: View topic - Can we laugh at ourselves? Can we laugh at ourselves? The ‘one finger Vangelis’ part made me laugh out loud. Loads of folks took it in good spirit when it was posted last year. 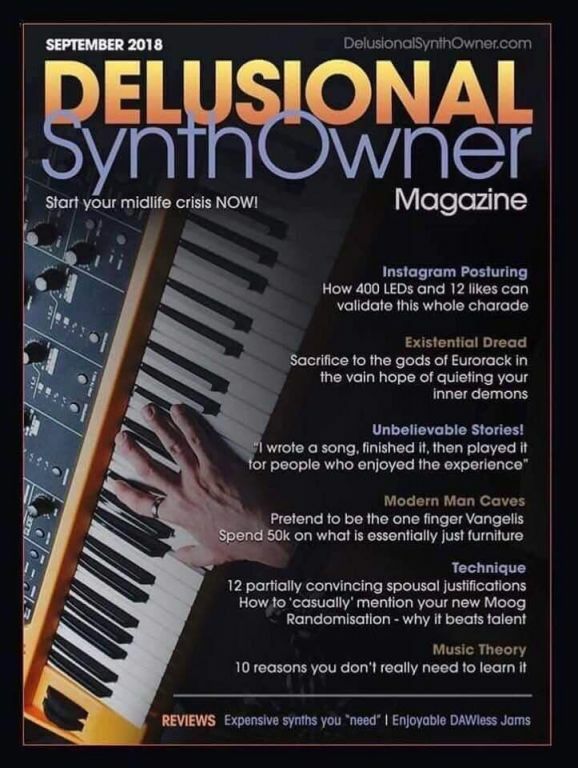 spot on, the onion for middle aged synth geeks. This is more like parody with a sledgehammer, which isn't particularly clever. Beyond that, to answer the question, "Can we laugh at ourselves?" I rarely get past laughing at myself, so my immediate answer is, "Yeah, so what else is new?" Having an easy capacity to laugh at oneself and many other aspects of living is part-and-parcel of taking life as a whole seriously. I really would buy this a magazine. I found my subscription came through automatically once I hit 50 and got divorced. Will there be a Part 2 for the Spousal Justification series? I need some more tips. Existential Dread describes me pretty well. In the next issue: Manuals - Crutch for loser noobs, vehicle for artistic expression, or completely unnecessary? We interview Whimsical Raps, Mark Verbos, Arius Blaze, and others! Nope! Self deprecation is dead, and the latest casualty after irony. That said its hilarious when one uses self deprecation these days and someone is perplexed and says: why are you so down and negative on yourself? One can Try, in all jest, to answer and explain self deprecation. But the idea is near extinct. Explaining the concept, well.....It’s all Very much like talking to aliens. You know, people on this thread could actually band together and write this. And it would be funny. My wife and I had a good laugh over this one. this. it seems like, between poe's law and the weird autistic tendencies of internet forums currently, humor won't be grasped unless it's explicitly stated. the other side of the coin being that if it's explicitly stated, the response will be that it's not funny, that you shouldn't joke about that or, most perplexing, a response of "why?"